Lexington City Hall is located at 329 West Main Street, Lexington, IL 61753; phone: 309-365-3331. Photo: John Patton Log Cabin, ca. 1829, Lexington Park, Lexington, IL. Listed on the National Register of Historic Places in 1986. Photographed by User:A. McMurray (own work), 2007, [cc-by-2.5 (creativecommons.org/licenses/by/2.5)], via Wikimedia Commons, accessed July, 2014. The history of the City of Lexington began with Native American tribes. Kickapoo and Delaware tribes were the first known to come to the area and set up villages along the Mackinaw River. According to historical accounts dating back to the late 19th century, these tribes lived in villages which had an approximate population of 300 persons. The villagers lived in wigwam dwellings with earth banked up along the sides. These tribes supported themselves by hunting, growing corn and tobacco, and making maple sugar. Men of the Native American tribes were often gone for long periods of time on extended hunts. The women of the tribes gardened and took care of the crops with the crudest of tools. Tribal people were very welcoming to the first European settlers. The first European settlers arrived in the area in approximate population of 300 persons. The villagers lived in wigwam dwellings with earth banked up along the sides. These tribes supported themselves by hunting, growing corn and tobacco, and making maple sugar. Men of the Native American the late 1820's. Records indicate the first white men to settle in the area were Conrad Flesher, John Haner, and Isaac and Joseph Brumhead. Most of the early European settlers were from Ohio, planning on a more westward migration later on in their lives. The first settlers also settled along the Mackinaw River just south of the present site of the City. Like the Native Americans, the settlers depended on farming and hunting for survival. Crops grown included corn and a variety of vegetables. 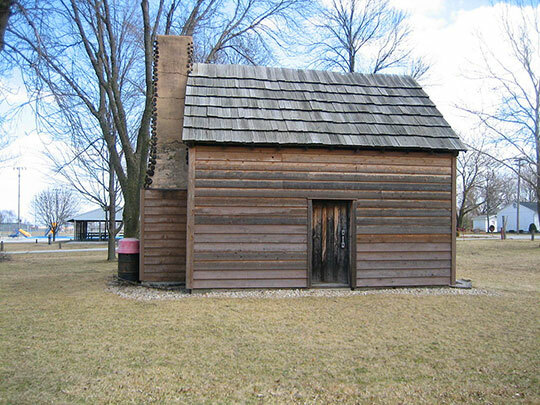 The early housing consisted of log cabins that were built by using only an ax and auger. No nails or iron connections were used to construct the dwellings. Other settlers moved into wigwams abandoned or no longer needed by the Native American tribes still living in the area. One of those was John Patton, who would have a profound effect on the new community in coming years as a Lexington leader. His family would be given credit for building the first house in the area in 1829 with assistance of local Native American tribes. The Native Americans and European settlers depended on each other. Their children often attended school together and those that lost their lives were buried in what was known as Indian Field Cemetery. From 1829 to 1831, the area grew quickly. Settlers from other parts of McLean County and Illinois moved into Lexington Township with some coming from Indiana and Kentucky. Letters written to relatives in Ohio and other parts of the country told of the "fine land and great opportunities in the area." Many of Lexington's first settlers were of English and Irish descent. Other settlers from the Mid-Atlantic region, particularly Virginia, would come later. Formal local government was established in 1830. New settlers continued to arrive despite the disruption of the Blackhawk War in 1832. Land speculation in and around Lexington was vibrant by 1834. The building of Fort Bartholomew meant added security for local farmers, although the fort was never called on to provide defense for the community. Lexington was platted on January 14, 1836 by Ashael Gridley and James Brown. Gridley and Brown acquired the land from the federal government. Gridley would become well-known for being responsible for plotting and planning several communities in McLean County. Brown was a Kentucky pioneer who had established a partnership with Gridley. The two men named the new community Lexington since Gridley's father had fought with the Minutemen in Lexington, Massachusetts during the Revolutionary War and Brown had come from Lexington, Kentucky. As more settlers arrived, they chose to make their homes near the timber of the Mackinaw River. In addition to corn, they grew potatoes, squash and beans, which according to historical accounts, produced yields of 40 bushels per acre. They also were successful in producing an impressive wheat crop. However, the crop would no longer be planted after 1860 due to a problem with insects. During this time, Lexington also became noted as an important horse and cattle breeding community. By 1837, the town had grown so much it established its first post office. Jacob Spawr was named the community's first postmaster that year. In what would be a long tradition of joining the new town with the development of religious institutions, the first church in Lexington was built in 1842. The United Brethren Church evolved into the Evangelical United Brethren in 1846 and later became the Evangelical United Methodist Church 122 years later. The city's first school building was built in 1843. Although local children had been schooled with students from local Native American villages, the new school was an important symbol of the community's future. Independence Day 1854 began a new era in Lexington's development. That day, the Chicago and Alton Railroad began service to Lexington. The expanding rail system would improve local farmers' access to markets as well as provide a transportation system for new people and goods arriving from all over an expanding nation. Lexington was incorporated in July of 1855. From the 1850's through the Civil War and the rest of the century, Lexington became home to new families, civic institutions, expanding schools and more churches. With the railroad came improved methods of farming, including improved plows and harvesting techniques, and better prices for grain. By this time, Lexington was home to several large dry goods stores, two banks, two flour mills, a broom factory, cultivator factory, a brickyard and a nursery. Settlers from foreign countries also arrived about this time putting their culture and mark on the community. As recently as 1960, fifteen families from the original Lexington pioneers were still holding land in the area. In the mid 1800's, the village of Pleasant Hill, which was built southeast of Lexington, was also a thriving community. It offered many of the amenities of Lexington and more. Pleasant Hill eventually became a ghost town after it was bypassed by the railroad. The mid 1800's also saw a spiritual growth in the community as many of Lexington's religious denominations built churches during this era. Lexington's new school building was also erected on the west side in 1857. By 1874, Lexington had built an impressive network of roads that crossed the township. By 1887, the community had built what is believed to be the first hard-surface road in McLean County. The growth and affluence of the town was symbolized at the turn of the century in 1901 by the construction of the Van Dolah Castle on the west end of Lexington. D. J. Van Dolah was a respected international businessman who made his fortune in animal breeding. The community began to take on the look of an established community in the early twentieth century. Permanent structures for a bank, library and high school were all built before the end of 1916. The McLean County Farm Bureau was formed during this period to help bring electricity to Lexington and other rural communities within McLean County. Recreation facilities and city parks were built during this period with the dedication of the city park bandstand in 1925 and the formation of the Turkey Creek Golf Club in 1929. Agriculture continued as the primary economic activity of the region through the 1900's. Continued expansion of the railroad and the introduction of the national highway system during the mid 1900's also shaped Lexington to become a multifaceted community. Lexington's future was greatly benefited in 1938 when it was announced that Route 66 would run through the community. Several other significant building projects followed, including construction of a hemp plant in 1942 (later became Cargill Seed Plant) and construction of the high school and the elementary school addition and fire station in the 1950's. The high school was totally reconstructed in 1962, and underwent extensive rehabilitation in 2003 due to a major fire. Lexington's agricultural history has provided stable employment that has created spin-off service industries and businesses, which have stood the test of time over the past 20 to 30 years. The community continues to re-create its downtown as evidenced by the construction of the community center and the continued prosperity of locally owned and operated businesses. It has also taken advantage of recently established tourism events such as the Taste of Country Fair and the Route 66 Auto Reunion, which draw attention to the City as a tourist destination two times a year. McClean County Regional Planning Commission, City of Lexington Comprehensive Plan, Community History, 2005, www.mcplan.org, accessed Jult, 2014.